The World of Althéa: What's In Your Inventory? This is going to be a brief post this week, as there is not much I can report on without giving away spoilers (again). However, one thing I have been looking at this week is increasing the number of items a player can acquire for their PCs. While I started to design a few new ideas myself, I also went in search on the Vault for some and found Apep's "Magical Miscellanea Package", from which I found some useful items that will save me some time. That said, I do need to alter many of those that I may include, simply to work with the rest of my module. However, I believe I will save more time than it loses in adaptation. It was as I was considering the different items a player might buy for their PCs that I began to think what the average player might like to include as their standard "adventurers kit" for their characters. I think we can take class items as read (E.g. a sword for a fighter, etc. ), but what about the other things? Do you consider light sources, potions, healing kits, etc.? I know some of these items might still be governed by the PC's class, feats and skills, but are there items that simply do not fall into this category, or are simply "must haves" before you head out to the dungeon? Would you prefer the "improved" lantern design sir? So, have a think and let me know if there is anything you recall as being "essential" items that you liked to have before you went adventuring. .... :) e.g. 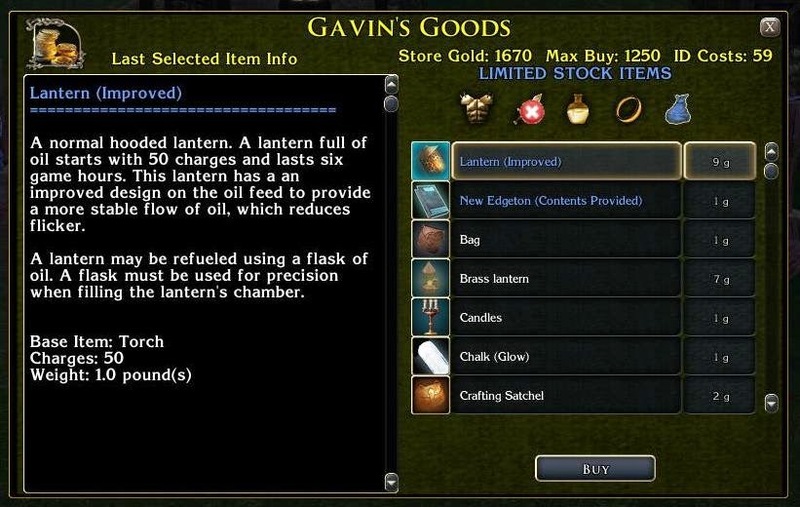 Bags, light sources, potions? You name it. You may want to look at the item pack I created for Crimmor. I went through a bunch of DnD sourcebooks and make items from them. Some things to serve as alternate treasures or plot items, plus magic items of all levels from 0 + 1 vs goblinoids type, to artifacts, complete with their descriptions from the sourcebook. Exactly the kind of thing I am looking for to try and complement the items the player can buy (or find) for their PCs. Many thanks for the link ... I am downloading and taking a look now. I really don't see why people put so much effort into torches. A single cantrip makes them all completely useless. Just giving you my two cents as a player... all this utilitarian stuff becomes obsolete the second you start the game because magic and potions trump it all. And it is a high magic world. Yes, for those players using spell casters, the Light cantrip is definitely the way to go. I would do the same. However, I did consider a couple of other potential situations, such as playing as a fighter (and deliberately avoiding spell casters) and anti-magic areas. High magic world .... I thought mine was nearer a low-mid level, but it's been a while since I last read what defines such. Do you recall what the boundaries that determine low-mid-high magic worlds are?